The Inspector General of Police (IGP), Ibrahim Idris has explained why he was not physically present to honour the invitation of the Senate Chambers of the National Assembly over the Dino Melaye saga and other issues. The IG explained that he was absent because he was on an official assignment in Bauchi State with President Muhammadu Buhari. The Senate had summoned the IG to appear before it to answer questions on why Senator Dino Melaye was handcuffed by Policemen and the spate of killings and insecurity in various parts of the country. The IG sent the Deputy Inspector General of Police in charge of operations, Joshak Habilla to represent him but the Senate rejected the representation. 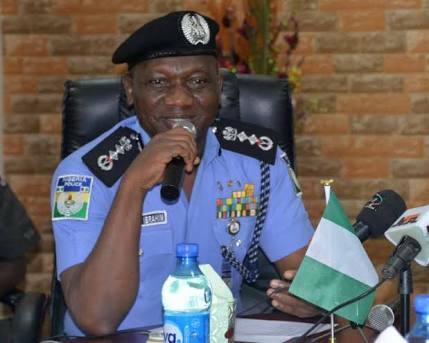 The Police in a statement in Abuja on Friday while quoting the Constitution said the duties of the IG could be carried out by either a DIG or an AIG. The statement by the Force Spokesman, ACP Jimoh Moshood reads: “The functions, duties and responsibilities of the Inspector General of Police as listed in Section 215 of the Constitution of the Federal Republic of Nigeria can also be carried out as mentioned in section 312 (1) of the Police Act and Regulation by a senior officer of the Force of the Rank of Deputy Inspector General of Police and Assistant Inspector General of Police who if permitted by the Inspector General of Police to act on his behalf or represent him in official capacity at any function, event or programme within and outside Nigeria can do so in consonant with the provisions of the Police Act and Regulation. On Melaye’s case, the Police urged the Senate not to trivialize the case against Melaye adding that the Senate should allow the rule of law to prevail. “The Nigeria Police Force is a law abiding organization and holds the Senate and its leadership in high esteem, however the Force wishes to impress on the Senate of the Federal Republic of Nigeria not to personalize or trivialize the criminal offenses (Criminal Conspiracy and Unlawful Possession of Prohibited Firearms and other sundry offenses) indicting Sen. Dino Melaye from confessions of two (2) suspected kidnappers and Armed Robbers namely: KABIRU SAIDU a.k.a OSAMA and NUHU SALISU a.k.a SMALL; but should allow the rule of law and justice to prevail."